• Conflicting evidence is often the result of "medical chatter." • POEMs and guidelines require the least amount of work to find relevant and valid results. As the formula shows, busy clinicians should concentrate their efforts on easily obtained, valid evidence that is highly relevant (i.e., patient-oriented evidence). Such a strategy focuses attention on useful information and makes wise use of limited time and resources. As shown in Figure 10-1, the work required to find useful medical information is inversely proportional to its quantity. At the bottom of the pyramid is original research. Although plentiful, much of it represents "medical chatter" among researchers (Slawson et al., 1994). Researchers are intimately familiar with published data in their narrow field of study and are able to place the article in its proper context. A busy clinician reading a single article in a relatively unfamiliar field is akin to overhearing a snippet of conversation at a dinner party. It may be dangerous to base decisions on such snippets without knowledge of the larger context. Checking the relevance and validity of such studies requires knowledge of statistical methods and study design. It is too time-consuming to be useful for answering clinical questions that arise during a patient visit. At the next level of the pyramid are systematic reviews and meta-analyses. These types of studies focus on a single topic and attempt to draw conclusions from the volume of previously reported data. Although an improvement, the clinician still must explore the methodology used to select and analyze the data to ensure relevance to the clinical question. Often, these types of reviews focus on disease-oriented outcomes rather than patient-oriented outcomes, potentially making them less relevant. Disease-oriented outcomes, such as an increase in bone mineral density, may be a secondary marker for fracture risk, but they are inherently less relevant to the patient. 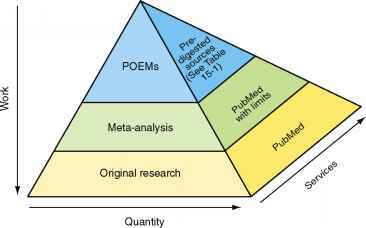 At the peak of the pyramid are patient-oriented evidence that matters (POEM) reviews (Table 10-1). Clinicians must decide if the POEM is relevant to their clinical question, but the amount of work required is greatly reduced. POEMs offer the most useful type of information for answering clinical questions that arise during patient visits. Unfortunately, a POEM does not exist for every clinical question. In these cases the clinician must step down the pyramid until relevant information is found. methodology, study populations, statistical power, and bias often explain the different conclusions and result in medical chatter. Putting such articles in their proper context is difficult at best for the practicing clinician. Moving up the evidence pyramid helps alleviate conflicting evidence, yielding results that are more reliable. Often, minimal or no reliable medical evidence is available to answer a clinical question. In these cases, practicing clinicians must rely on their clinical experience and background medical knowledge—their mindlines. Haynes (2001) defined another pyramid that is relevant to answering clinical questions. This is the pyramid of services for finding the best evidence. It is depicted as the third dimension of the evidence pyramid (Figure 10-1). At the bottom of the pyramid are tools to find the original studies. The National Library of Medicine maintains a database of more than 15 million articles, called MEDLINE. Various engines are available to search MEDLINE and other databases for articles that may be used to answer clinical questions. For example, PubMed (www.pubmed.gov) provides tools to help clinicians search for meta-analyses and systematic reviews through the use of limits and clinical queries (Ebbert et al., 2003; Haynes and Wilczynski, 2005; Sood et al., 2004). As in Mrs. Smith's case, there may not be a single study that addresses the specific question posed. In looking for the best evidence to inform clinical decision making, it is important to determine the standard of care for the patient's condition. Clinical guidelines, which are typically updated every 2 years, may be a useful resource. An excellent clearinghouse for clinical guidelines is sponsored by the Agency for Healthcare Research and Quality (AHRQ, www.guidelines.gov), although the listed guidelines are neither reviewed nor endorsed by AHRQ. Clinicians must critique the guidelines for validity and relevance in their own setting. This resource is higher up the services pyramid and reflects some interpretation and synthesis of original research and clinical practice. You review the Institute for Clinical Systems Integration guideline for osteoporosis prevention and HRT at www.guidelines.gov, as well as the risk/benefit data from the www.WHI.org site (Figure 10-2). These guidelines tell you that HRT should not be used simply for prevention of osteoporosis in the absence of other significant menopausal symptoms. You reflect on your colleague's words: "Get everyone off that stuff!" 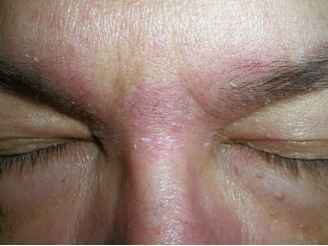 It is time to have a discussion with Mrs. Smith regarding her estrogen therapy.